They are all ideal to use as a desktop momento or an award for a commemorative occasion. The "Dididisc" comes complete with a stand or can be hung on a wall so everyone can have that “rock star” award they’ve always wanted. It comes with a choice of a red or black disc. We'll Be With You - inspires memories of our finest hour, The League Cup victory at Wembley on the 4th. March 1972, a 2 - 1 victory over a small team called Chelsea from somewhere called London. The label is in classic Stoke Red & White colours on "SCFC Recordings." The League Cup. It also includes the text "The Potters" and "We'll Be With You" and is completed with the statement "Made in Stoke – Maximum Volume." The archetypal silhouette of Stoke – on – Trent’s most iconic image the bottle kiln completes the label. This disc can be personalised with your own message of upto 100 characters. 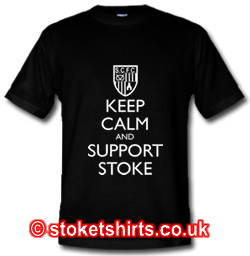 Please email info@stoketshirts.co.uk with the message you would like to include after placing your order. The discs include a dedication plate that will be personalised with any text requested and a coloured mount.